Happy Friday! The week has been difficult. I have been sick with severe allergies all week, and I am ready to get back to normal. Since this week wasn't the best, I thought I would share my 5 favorite recipes with you. I hope you all have a great weekend. Link up with Lauren at From My Grey Desk. 1. We all love chocolate chip cookies. Once you try this recipe you will never go back to the plain old chocolate chip cookies again. 2. Blueberry pancakes are great for Saturday mornings. Maybe I can talk Kevin into making them tomorrow. 3. Chicken and rice is a super simple meal with lots of flavor and little effort. 4. Kevin's Salsa is awesome! There really is nothing else to say. 5. Yum! 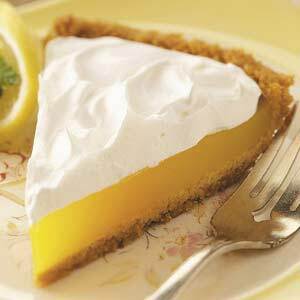 Lemon pie is great all year.